Fire suppression systems using liquefied gaseous agents commonly choose carbon dioxide (CO2). CO2 is effective and inexpensive. However, it is also lethal to humans when over 17% concentration. The design concentration found in the cylinders is way above the level we can breathe. Thus if a cylinder discharges with someone in the area, there is an incredibly high risk of illness if not fatality. Therefore, when maintenance of the fire suppression system is due to be conducted in the cylinder room, its vital that the personnel are alerted in the event of an accidental discharge by the manual release valve. 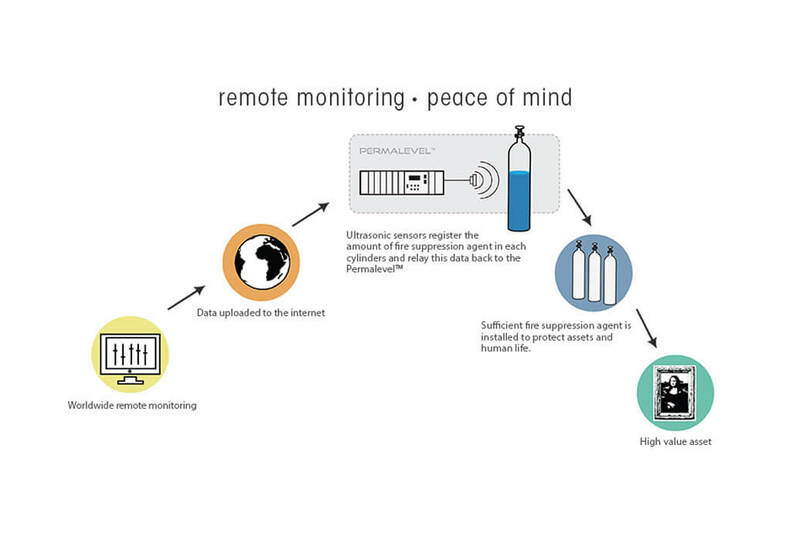 Therefore Coltraco Ultrasonics designed the Permalevel® MUTLIPLEX, a constant monitoring system, which provide immediate notification. Continuous monitoring’s protection is essential, because the pressure switch and select valve commonly break. No. 1 There are regularly cases when the select valve does not open i.e. fused and therefore the pressure switch on the delivery pipe will not be able to notify about this manual accidental discharge. If and when this select valve does not open, there is potential that accidental discharge will case the agent in the fire suppression system to accumulate. This built up pressure may cause the manifold to burst. No.2 In cases where the select valve opens, but the pressure switch is broken no notification will be given about the discharge. If maintenance is being carried out in the protected enclosure as well, accidental discharge would cause the protected enclosure to be filled with agent thus potentially leading to fatality to the occupants of the manned space, but no notifications could be given about the discharge because the pressure switch is broken. Having a Permalevel MULTIPLEX to monitor cylinders at its source will be able to address issues related to accidental discharge. The Permalevel® MULTIPLEX can also provide immediate notification if the cylinder has been discharged, quicker than the notification from the pressure switch on delivery pipe which could take up to 3 – 4 seconds later.